By way of example, I offer our ride to Cinnebarre Thornton Town Center Theaters. It’s interesting because it traverses a congested part of town with many route possibilities that run the gamut from busy multi-lane roads to meandering multi-use trails. Here is the bike routing advice offered up by various map platforms. Bing Maps is conspicuously absent because it doesn’t know what a bike is. All but one of the platforms routes cyclists on Washington Street, bad advice for any but the most experienced vehicular cyclist. Here Maps at least provides some alternatives, but none for the Washington Street problem. Google and Here Maps use their own proprietary map data whereas Mapquest uses Open Street Maps (OSM), but MapQuest’s routing is no better. Compare that to Mapzen’s results, also using OSM. 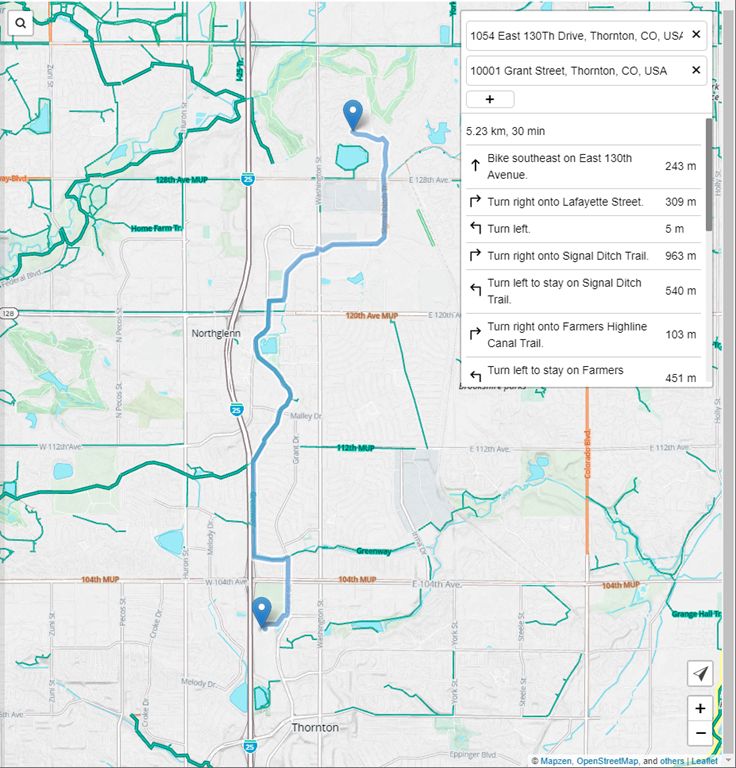 Mapzen completely avoids Washington Street and uses the complete section of greenway that runs parallel to I-25. As far as I can tell this is exactly the route that we’ve painstakingly discovered through trial-and-error, now achievable with a single query to the Mapzen routing engine. OSM cycling data is at least on par with Google’s but it’s Mapzen’s routing engine that makes the difference in this example, piecing together Signal Ditch Trail, Farmers Highline Canal Trail, and the Greenway to provide a route that is mostly on bike path and never on a busy street. 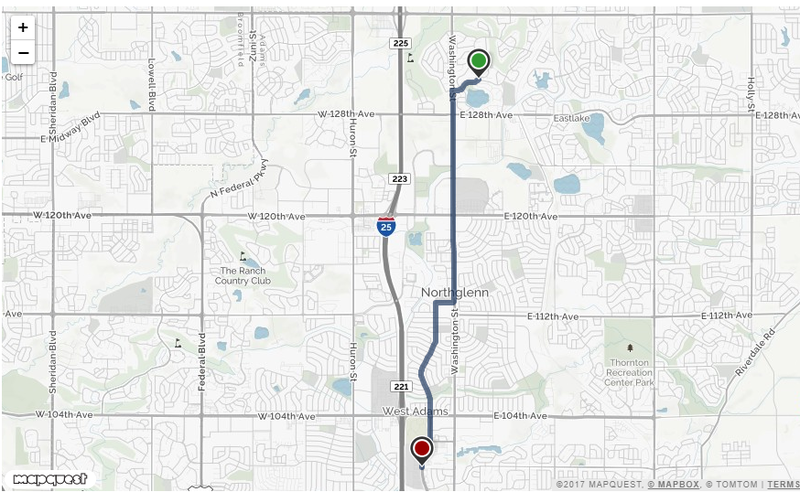 It adds about a half mile over a more direct route but for my family this is a welcome tradeoff. Mapzen calls this the low stress routing option. Low stress is only the beginning—Mapzen’s routing engine offers unprecedented control. Low stress routing is achieved by setting two key parameters, use_roads and use_hills, to their smallest values in a range from 0 to 1. If you’re comfortable riding in traffic, choose a higher value for use_roads. Routes similar to the other platforms can be achieved by simply increasing this setting. Changing the use_hills setting doesn’t do much on this route because it’s pretty flat, but it makes a huge difference in the Boise foothills where I ride a lot. Mapzen has clearly given a lot of thought to bike routing and you can read about it here and here. In the first link they talk about testing their low stress option on “The Wiggle” in San Francisco. I can relate—my daughter and I negotiated The Wiggle on our cross-country ride a few years ago. We had to use local knowledge from friendly cyclists. Not a bad way to travel but an accurate route on my phone sure would have been nice. The combination of Mapzen’s routing engine and OSM’s map data is a game changer for bike routing. I didn’t have to edit the map data to achieve the routing shown in this example, evidence that OSM map data is already quite good. Recently I’ve edited the map back home in Boise which shows how easy it is to fix the data when necessary. With these changes and the Mapzen routing I can now generate routes that match what casual cyclists actually use in Boise. I’ve never been able to do that before. I created a test map that lets you play with Mapzen routing—check it out and see how it does with your favorite routes. Or use it to find new, better routes. If you find routing problems it’s likely due to missing or misrepresented roads: edit the map data. Update: Mapzen has shut down its services so the above “check it out” link no longer works. Sadly this means their game-changing bike routing is no longer commercially available. The source is open and available, hopefully someone (MapBox?) will incorporate it into their routing engine.